During wars in the 18th and 19th century if you were an officer you traveled to the front in style. 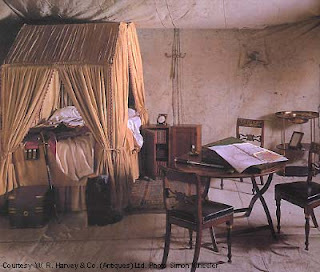 You brought your own furniture, and the comforts of home (including servants!). Your suite might include trunks, dressers, bed, desk and chair and assorted tables, all of which could be folded up for transport. Today, campaign furniture is at the height of chic. A little bit masculine by it's very nature, and thus so easy to use in a tailored room decor. 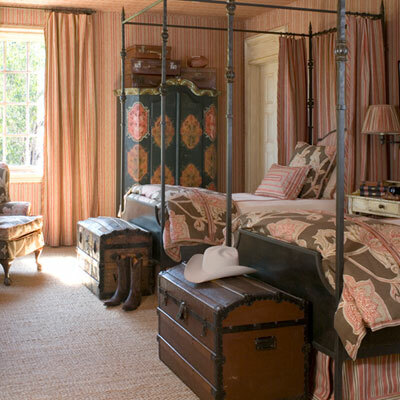 This bedroom designed by Joe Minton includes campaign style beds and trunks. This little campaign table is one of the earliest antiques that I got as a kid, and it has traveled with me everywhere. It has a decorated brass trim and leather top. The campaign desk above is wonderfully chic. This room was designed by Atlanta based designer Suzanne Kasler. Look for the X legs and the ability to fold up and move to your next camp! 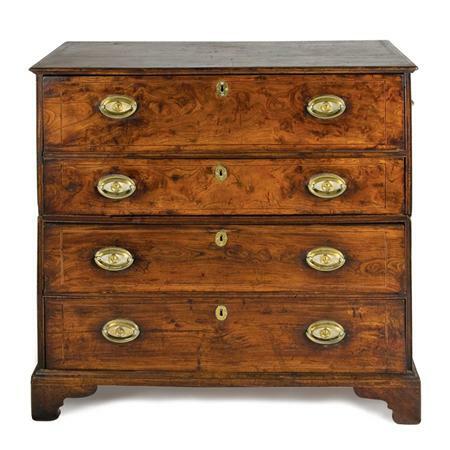 This campaign chest is an excellent example of a multi-tasking piece of furniture. It's a late 18th century two part chest of drawers with handles on the sides for carrying, and is fitted with a writing desk in the top drawer. It sold at a Doyle New York auction for $1,625. I have always liked these traveling desks. They fold up into a very handsome box, and open anywhere for writing (not that we write letters on paper very much anymore!). This one sold at a St. Charles Gallery auction for $276. It's a William IV brass inlaid and rosewood lap desk. I've seen them put on stands and they make a smart looking side table. Of course if you were on the road conducting a war you needed a chaise on which to rest. 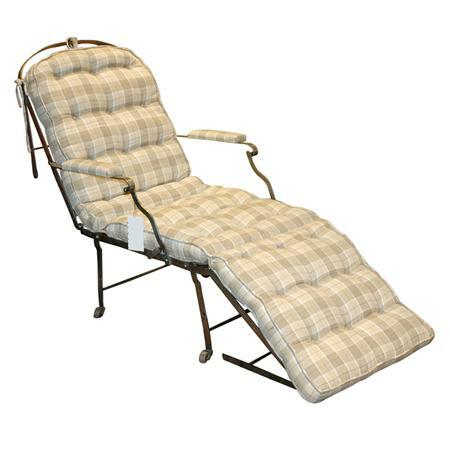 This folding iron campaign chair is a great example, and can serve several functions from reading chair to a sleeping cot. This sold at a Doyle new York auction for $469. 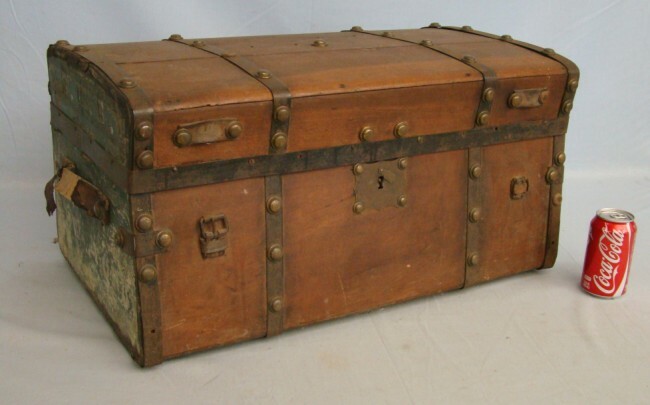 You, of course, needed a trunk. I like this one coming up at the October 23rd Copake Auction. It's Lot 513, 19th century and has an auction estimate of $25 - $45! This very smart British 19th century mahogany and rattan campaign chair sold at a Brunk Auction for $1,300. 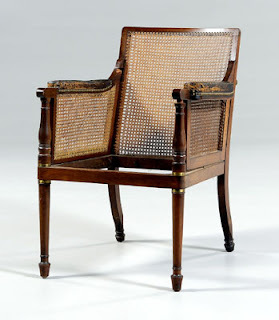 This was well above it's estimate and is a testament to the allure of campaign furniture. Campaign furniture is very chic, and it's designed to be smart and functional. Keep your eye out at auction, and find the perfect piece for your home! Katherine: Why does every thing I bid on go for 10 times the estimate, and all the things I would have bid on, go for nothing? Oh the remorse! The campaign furniture was a great learning experience....functional, simply elegant and transportable creature comforts for the world's warriors. Thanks for the comment. I checked your website. Looks interesting. Where do you ship from?